Floral Playsuit - Pretaportobello* Clutch Bag - Pretty Little Thing* Shoes - Missguided (Similar Here and here) I love how occasionally it's been really nice weather here in the UK. This means summer is here! I love summer, It's my favourite time of the year and when this playsuit arrived in my postbox I knew it would be a great summer staple for those sunny days. If you've not heard of Pretaportabello before you're definitely missing out. They are a family run business which stock so many gorgeous items. They're so affordable too, it's like shopping on Topshop or ASOS. If you're looking for slightly more quirky items Pretaportabello is the place for you! Floral Playsuit - Pretaportobello* Clutch Bag - Pretty Little Thing* Shoes - Missguided (Similar Here and here) I've teamed this playsuit with a simple white clutch bag and white wedge heels. I think wearing white with such a statement piece like this playsuit really tones the outfit down so it doesn't look too bold. I'm loving slogan clutches at the moment and I think adding one to your wardrobe this summer will be an essential! 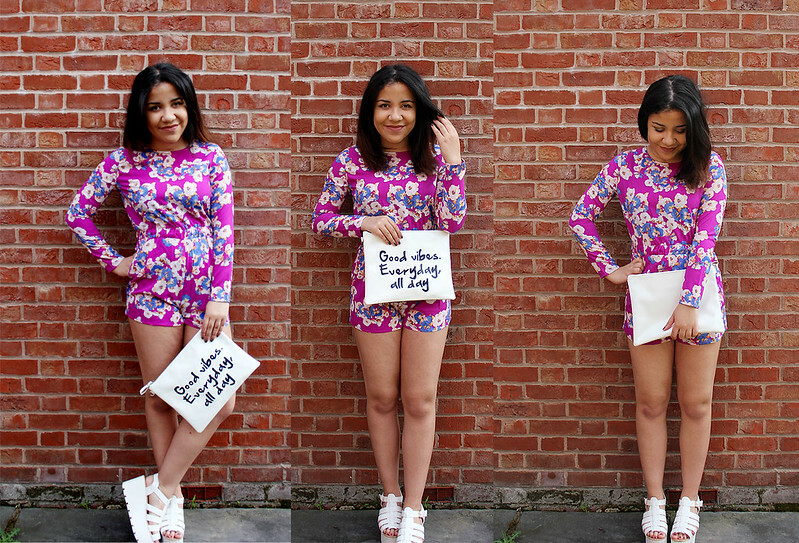 That playsuit looks amazing on you! I love a good ol' vibrant print and this one looks amazing on you!